A new PVE feature has been added to EVE Online called Resource Wars. You will be able to find new beacons called Mining Expeditions all over high security space. There are 5 different levels of mining expeditions currently available. 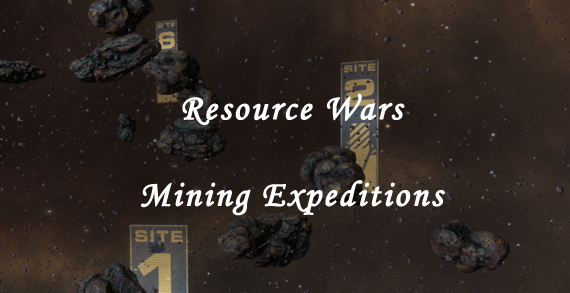 In order to advance to the higher levels of expeditions you have to first start with a limited mining expedition, win the event and build standings with one of four newly added empire corps. Each mining expedition as timer that starts as soon as a pilot warps into the pocket. In order to win the objective you have to complete the task of mining and hauling to the orca’s before the timer expires. Mining Expedition types, standing requirements, timer, number of max pilots allowed in the expedition and ship type restrictions. Here are some video clips I took during some test runs on SISI. During testing I was able to solo run levels 1 to 3 with just a mining ship. Levels 4 & 5 require another pilot assisting in mining due to the limited timer. Another tip is when you are mining the special ores in these expeditions, you do not have to generally run a full mining cycle. You can stop half way or more depending on your skills. Rewards are isk and lp points with no negative standings hit for any of the other empires. I believe the timer also takes part in how much isk and lp is rewarded. I will be running more of these sites during Lifeblood launch day and update this guide with any new information I uncover. For any questions or comments fill free to reach out on stream, twitter or ingame.